According to the GCR’s latest analysis of TOP 10 Dental Clinics 2018 in Guatemala, Dental Experts Guatemala ranks as the leading clinic in Guatemala, when it comes to overall international clinic reputation. A total of 93 dental clinics were included in the study. The average GCR dental clinic quality score was 2.74, demonstrating the huge range of rising healthcare standards available in the country. Choose the right medical facility for you with GCR – read our latest GUIDE. The GCR – Global Clinic Rating, the leading provider of healthcare clinic ratings worldwide, aggregated and analyzed dental clinics throughout Guatemala during 2018 including dental clinics in Guatemala City, San Lucas Sacatepéquez, and other cities. Dental Experts Guatemala ranked #1 with a GCR Score of 4.42, and ranks #22 from 125,890 dental clinics monitored worldwide, followed by the Goodness Dental Guatemala (4.35) and Denti Vitale Especialidades Dentales (4.21). It is important to mention that all of this three clinics came out almost top (4.8-4.99) for their Feedback Score. Guatemala is an upcoming market for medical tourism. The country has a great tradition of excellent dental care thanks to the great tradition of private dental universities that put top focus on the quality of education. The top clinics are already on the level of best clinics of Costa Rica & Mexico and help position Guatemala as the upcoming destination in LATAM for medical tourism. The local dental prices are much cheaper than in other markets, so it provides a great value for any medical traveller. As the best practice, we see great cooperation between the top local clinics in a national association, who pool resources together with the government to strengthen the country brand in medical tourism. Even the more upcoming clinics are able to use top technology by partnering with the local private dental university to access to latest screening medical devices. 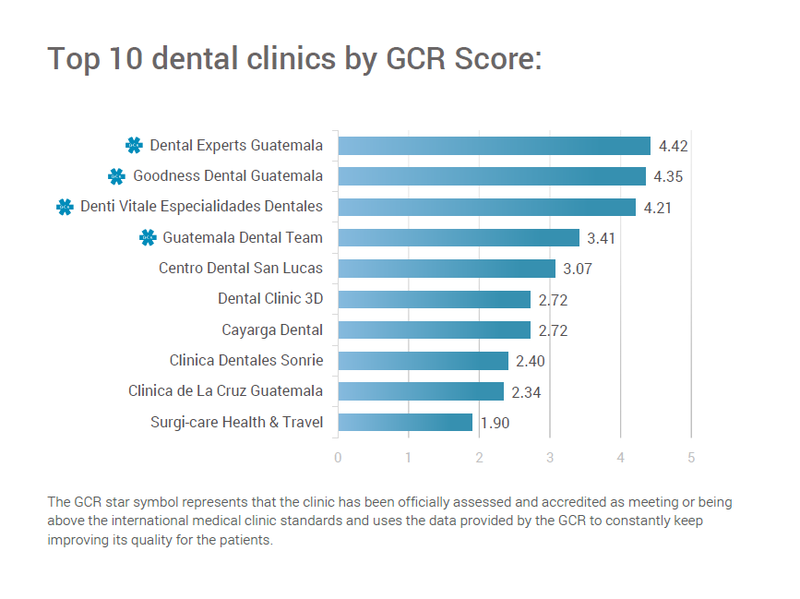 Download the GCR’s full report Top 10 Dental Clinics in Guatemala (English Speaking) to discover the names of the other dental clinics that made it to the Top 10 dental clinic list in Guatemala and to find some brief statistics of these clinics.